I hope you are enjoying the cool, crisp mornings and taking the opportunity to appreciate the dew, falling apples and harvesting pumpkins and the beautiful colors of this time of the year. Each season brings something unique and special to our environment. We feel the same about your children. Each of them is unique in their own way and we have enjoyed spending quality time building healthy relationships with them during the normalization period. We are excited to share what we have been learning during our normalization period. When you joined our Montessori family, you committed to an environment focused on peace, relationships, grace and courtesy. You will also observe these qualities when you visit. We are excited to have our community join us during school hours next week through classroom observations, volunteering and sharing your talents in various ways needed. Our normalization period ends on Friday, October 5th. Classroom visits will begin Monday, October 8th. If you would like to schedule a classroom observation with your child’s teacher, please call Ms. Emily in the main office. 9:15am until 4:15pm, and parents will continue to sign in during regular school hours as usual. As we continue to focus on safety at Chantilly and all CMS schools, please remember that any parent who visits for lunch, volunteers in a classroom, or chaperones a field trip must be a registered CMS volunteer. This has to be renewed every school year at https://www.cmsvolunteers.com/, so plan and do so immediately. Safety is our top priority and it is OUR responsibility to ensure this for everyone. We appreciate your cooperation with these procedures as we work to keep our children safe. During your afternoon playdates, please keep all children away from the tree near the creek on the lower field. The pest control team came out this week and will have to do extensive work to remove the wasp nest inside of the tree. The exterminator visited our school yesterday evening and sprayed our playground areas for mosquitos. It is our hope that our students will continue to remain safe from our outdoor insects. Parent–Teacher conferences are October 31st. Please save the date, look for a memo from your child’s teacher, and sign up early. We are aiming for a 100% participation rate. Open House dates for Chantilly are Wednesday, October 24th , Thursday, November 29th and Wednesday, January 16th from 9:30-11:00am. Friendly reminder… We are having our Fall Beautification day this Saturday at 9am. We hope to see all of our families! Thanks to Laura Lindsey for running the show last week as we treated our amazing Teaching Assistants to lunch! I really appreciated her stepping up with short notice. Thanks also to Steve Montgomery, who is once again organizing volunteers for Open House. What makes Steve such a special volunteer? His kids have all graduated from Chantilly, but our school is so dear to their family that he wants to continue showing it off to prospective parents! Please email me at chantillyptopresident@gmail.com if you would like to help Steve at Open House on 10/24, 11/29, and/or 1/16. We are coming up on four big events for which we need volunteers! Jocelyn Chrisley runs the Book Fair, Sutton Shealy, Ericka Ulanday and Andrea Vasaune are planning Spaghetti Dinner and Harvest Festival, and Barbee Morrow, Patrick Slattery and Julius Ulanday are our leaders for the Parking Fundraiser. They can’t do it alone! When you see the sign-up requests, please add your name. Volunteer for one or all, but please do volunteer! Finally, one of the greatest things about Chantilly is our beautiful grounds. This Saturday is Fall Beautification Day, and we hope to see many of you there! Details from Gardening Chair Krista Murphy below. 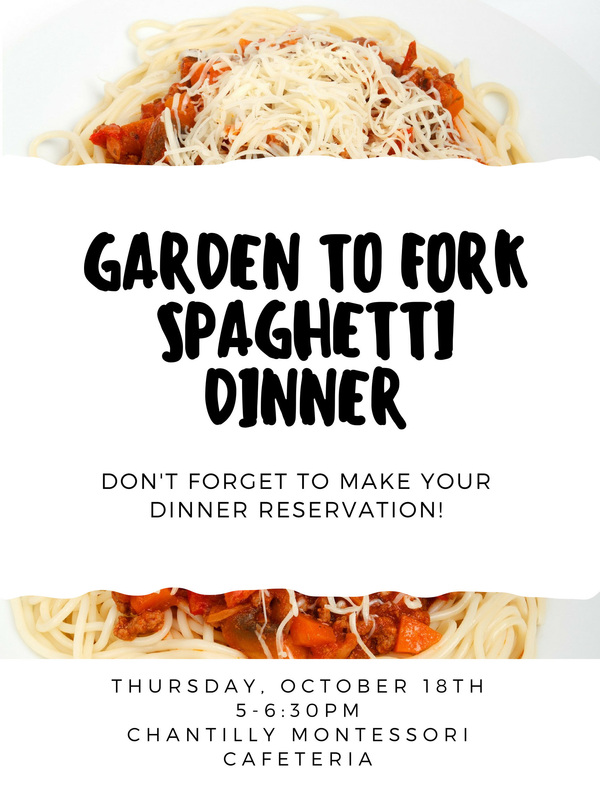 On Thursday, October 18th we will be holding our annual Garden to Fork Spaghetti Dinner! This wonderful dinner is sponsored by the PTO and entirely free! The sauce is made by students in Upper El (sign up to oversee the sauce making below), decorations are made by Primary and Lower El students, and dinner is served by Chantilly Alumni and parents (sign up to help the night of the dinner below). The book fair will be open during the dinner and there will be a PTO meeting following the dinner at 630pm. Come to eat, shop, and support our magical school! Please plan to drop in between 9am and 1 pm, Saturday October 6, to help get our class gardens ready for our Garden Buddy Volunteers and fall plantings. We will also be sprucing up our community areas. All ages are welcome, and no garden experience is necessary. Please bring garden tools and gloves if you have them! As always, a pizza lunch will be served! Contact Krista Murphy Woitkiewicz at kristamark1@gmail.com with any questions . The Bookroom needs some help! If you have two hours in the next few weeks, we could use some help organizing book bins for instruction and classroom libraries. Any help would be appreciated! Please email Ms. Elizabeth at laura.haviland@cms.k12.nc.us if you are able to assist. Chorus will resume on Tuesday, October 16 at 8:00 am in the Music Room. This is one week later than anticipated as Ms. Lisa will not be returning to school until Monday, October 15th. Thank you for your patience. We look forward to resuming rehearsals! Orchestra for fifth and sixth grade students will begin the week of October 15th. Thank you to families who have communicated to Ms. Lisa that their child will be participating. If your child is a first-year student and intends to take Orchestra this year, please email Ms. Lisa at lisa.lashley@cms.k12.nc.us before October 15th so she may plan accordingly. It is not necessary for the students to have their violin for the first week of instruction. If you would like information about orchestra for your fifth or sixth grader, please email Ms. Lisa at the above address. Thank you for supporting the music program. Welcome back! Last year Chantilly Montessori raised $380 in Boxtops for Education that students and families collected. This money goes directly back into the school to help fund events that benefit our students and staff. This is a program that helps schools earn cash by clipping the official Box Tops for Education Boxtops from the packaging of hundreds of different items. We would love it if you would collect them and send them in with your child! You can find them on a variety of packages, anything from school supplies to taco shells. Each Boxtop clipping is worth 10 cents and that can really add up quickly! Please keep an eye out for these Boxtops and send them in with your child. I have attached a link where you can view all of the items that they are found on. I like to do a monthly goal of $100 which should be easily achievable. As of right now we have only raised $30, $70 short of this months goal. If we can get the school and their families involved, we should be able to exceed last years amount significantly. You can send them in with your child, just please make sure the teacher is aware and gets them out. You can also take them to the office, there is a collection box for them in there. If you have any questions feel free to reach out. Yoga club will now be held every Tuesday morning before school in the gym. In addition, yoga club will be open to lower and upper el students only. (The primary are actually too young, but they will be welcomed in the future). Yoga club will begin on October 9.